The smart home market is gaining substantial momentum, with an estimated 900 million smart devices existing in households across the world today, based on Harbor Research’s Smart Systems Forecast Model. However, Harbor Research believes the biggest challenge facing the smart home market will be finding hardware and software developers with the technical expertise required to satisfy the growing demand. Today, product manufacturers are looking to quickly exploit the rapidly growing opportunity for enabling products such as lights, washing machines and thermostats and integrating these devices onto smart home networks. We believe one of the biggest challenges that lies ahead for manufacturers looking to enter or expand in the residential market, is their engineers’ lack of skills and technical expertise for creating smart home products and how much this will slow market development. 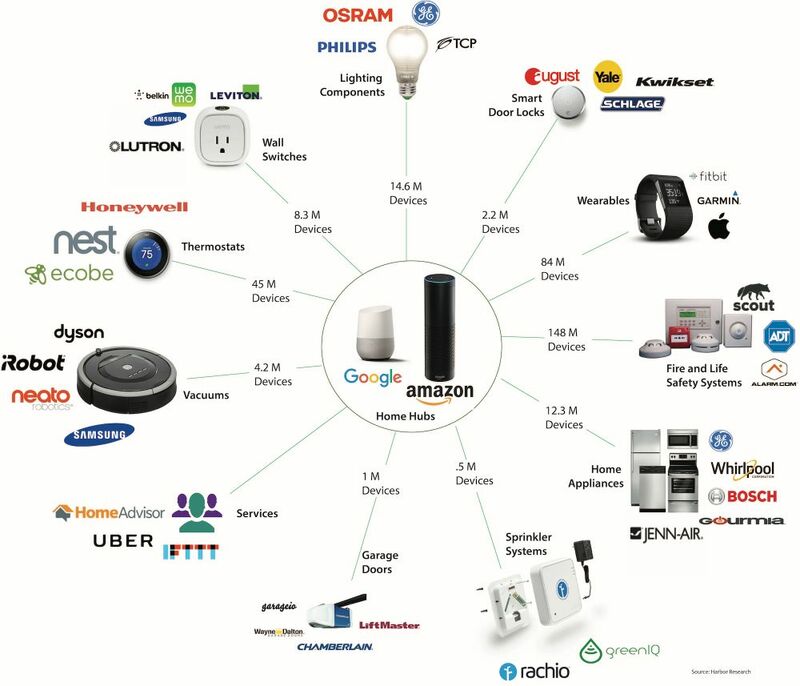 So, the big question that looms over this opportunity is, who will develop these home innovations; who will develop the hardware, apps and capabilities for future smart homes? » Will product manufacturers invest in developing these skills, or hiring these skills, or will they “sub” the work out to freelancers? » If this opportunity ends up getting enabled by free-lancers and “tinkerers” where will they originate – from the mobile developer world, from the incubators, accelerators, etc.? » Are there other “adjacent” untapped developer communities that might emerge, for example, from the IT professional services arena (that is currently collapsing and re-structuring)? » Uniqueness: There is a central tension in technology markets. Revenue growth requires collaboration, but sustained profits requires uniqueness. Collaboration requires that knowledge be shared. Participation speeds the flow of information and knowledge (driving growth) without foreclosing all opportunities to achieve unique advantage (driving profit). » Scale and Scope: Fast! Collaboration communities “fast-track” the development of new markets when the network of players acts as the “market” before such a market exists, keeping all interested parties effectively linked as the whole opportunity takes shape provides the enabling capabilities needed for success. » Coordination in Undeveloped Markets: The heart of any not-yet-existent market is a changed view of how people might use that technology to achieve desired goals. Networks bring together sources of expertise and provide coordination so that each “strand” of the community can work on a distinct piece of the solution. » See the Future: Plotting an effective course in emergent markets like the smart home requires acute peripheral vision. A collaborative community connects many participants and knowledge, some of which may have no direct impact on their business today, but any of which may be keys to success tomorrow. Efficient management of these informational links and relationships is critical to success. » Help Shape the Future and Ride the Next Wave: Collaborative communities are clear expressions of the “power of knowledge.” Those with the best position in the community can influence what others believe, and hence, what they do. Rather than owning declining-profit commodity products, OEMs in the smart home arena will own their distinct innovations, whether in technology, product features, services, or combinations and they will also own the data stream coming from their connected devices in the home. BUT WHICH ECOSYSTEMS SHOULD PRODUCT MANUFACTURERS ALIGN WITH? Companies wanting to play in the smart home arena need to ask themselves, “who are we, and what role do we play in the smart home market and their answers need to address two key dimensions: their distinct innovations as well as which ecosystem makes the most sense to align with. Once these questions are addressed, they need to determine how to organize themselves, their resources, and drive execution. If traditional manufactures lack the skills and expertise to bring smart home products to market, how should they view their ecosystem choice? If we take voice recognition and personal AI-based assistants as a case in point, how would OEMs view others’ roles in the ecosystem? Which network service providers are best positioned to enable and leverage connectivity and network services effectively….. and on and on and on. New sensing technology like voice recognition can act as a growth catalyst for a wide range of ecosystem participants. Does this mean that Amazon or Google will win? Will market development be driven by the creative combinations of new sensing technology and reduced developer complexity? HOW SHOULD OEMS BE THINKING ABOUT THER and THER PEER'S ROLES? » Which network service providers are best positioned to enable and leverage connectivity and network services effectively….. and on and on and on. There is no question that the smart home market represents a significant opportunity which will only continue to grow as end-users become more accustomed to intelligent products. But, simply embedding intelligence into products will not enable a smart home and any differentiated experience. These devices must be designed into a Smart System – not as an isolated product with narrow function but as part of a larger ecosystem of user experiences. As the underlying technologies to enable the meaningful and valuable user experiences matures and the devices become interoperable and the interfaces more user intuitive, choosing which developer ecosystem will be the critical and defining decision for most product manufacturers.